Lock in a great price for Shiraho Friends House – rated 9.1 by recent guests! Great location near the airport and the beach.Super friendly staff!i! They cooked for us making us feel cozy and home !! Thank you for making my trip even better! 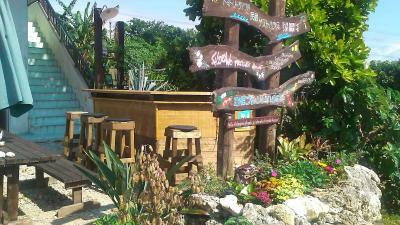 Great place to stay on Ishigaki Island. We liked being a little outside of the city center because it was so peaceful- but would recommend having a rental car or scooter for your stay for activities around the island. Hiro is super upbeat, friendly, and helpful for giving you the real islander advice on where and when to go. We took almost all of his suggestions and had a great time exploring Ishigaki. This hostel is great, all the staffs are helpful, the location is good, you will be in a very local area, quite and beautiful. I’ll stay again for sure! The owner Hiro-san went above and beyond to make my stay enjoyable. It felt like I was staying at a friends house, rather than at a hostel. He even took us sightseeing in his own car for a few hours when the weather was poor. Hiro-san and Yuya-san gave me great advice about the best way to explore the island. Great place to meet people. This place treats everyone like they are family and makes everyone feel comfortable! The rooms might be small but the atmosphere in the hostel more than makes up for any of that. The area is beautiful and peaceful and feels like home. Friendly staff and a good way to meet other people. Accommodations were affordable and basic. Friendly atmosphere, great hospitality and It was very good to follow Hiro san advise on activities and places even over our short stay, close to coral beach, a few local eatries and grocery. location covers most bus routes between airport and town, car rental nearby. kitchen ready n clean. Shiraho Friends House This rating is a reflection of how the property compares to the industry standard when it comes to price, facilities and services available. It's based on a self-evaluation by the property. Use this rating to help choose your stay! One of our best sellers in Ishigaki Island! Just a 2-minute walk from Shiraho Beach, Friends House features a free-use kitchen, free parking and free Wi-Fi throughout. Simple air-conditioned private rooms and dormitory-style accommodations are offered. A shuttle service is available from New Ishigaki Airport at a charge. Guests at Shiraho Friends House can enjoy a private room with a TV that looks out on local greenery, or sleep in a bunk bed in a room shared with other guests. All rooms have shared toilets and bathrooms. The property is a 4-minute walk from Shiraho bus stop and within a 5-minute walk from Shiraho Coral Reef Conservation and Research Center. Guests must reserve in advance to use the chargeable shuttle from New Ishigaki Airport, which is a 5-minute drive away. You can sunbathe or barbecue at the rooftop sun terrace or use the free-use internet PC at the air-conditioned dining room. There is an outdoor weight-lifting area, and the property has a free-use washing machine and a coin-operated dryer. 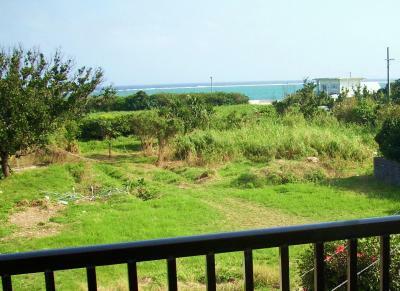 This property also has one of the top-rated locations in Ishigaki Island! Guests are happier about it compared to other properties in the area. 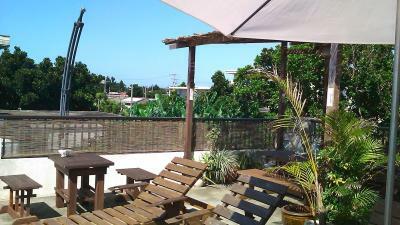 This property is also rated for the best value in Ishigaki Island! Guests are getting more for their money when compared to other properties in this city. When would you like to stay at Shiraho Friends House? Price includes 1 bunk in an air-conditioned room with 2 bunk beds (up to 4 total guests). Bathrooms and toilets are shared. Free Wi-Fi provided. Women only. Price includes 1 bunk in an air-conditioned room with 2 bunk beds (up to 4 total guests). Bathrooms and toilets are shared. Free Wi-Fi provided. Men only. Private air-conditioned room with a TV. Bathrooms and toilets are shared. Free Wi-Fi provided. Room is for 1 - 3 people. House Rules Shiraho Friends House takes special requests – add in the next step! Shiraho Friends House accepts these cards and reserves the right to temporarily hold an amount prior to arrival. To use the hotel's shuttle at an additional charge, please make a reservation at least 2 days in advance. Contact details can be found on the booking confirmation. Small to medium size pets can stay at this property. Guests who wish to bring their pets must inform the property at time of booking. (Charges apply). All bus lines from the airport stop at the Shiraho Bus Stop, which is a 4-minute walk away. The bus stop is the first bus stop from the airport. Please note that children are not allowed to stay in shared dormitory rooms. Amazing host and hostel, great vibe and very relaxed, fun and welcoming. Will be back! When it was time to leave, I was very sad. I wish I did not leave that little piece of paradise. I loved this place. It is hard to describe how great is it in a few words. It is a very relaxing and very fun place at the same time. The manager is a man of immense kindness. I have been deeply touched by the warm welcome of everybody working there. The help of Yuya for organising my trips to surrounding islands has been of very great value. The location is perfect, in a quiet spot, near a bus stop, with 2 good local supermarkets selling delicious bento. Being outside the city center makes it perfect to go watch the stars at night by the beach or on the rooftop. There is only one shower and one toilet for each gender on the floor with the dorms. The wifi did not work all the time. This is hands down the best hostel I have stayed at in Japan. As I found it sometimes difficult to meet other people in the cities, this hostel felt like family from the start. The staff is super nice, and the owner Hiro (Super-Hiro!) knows everything concerning Ishigaki and the surrounding island. There are events every other night, e.g. Hiro would drive all the guests to a band night in the city, or there would be a BBQ. Thus, you get to know the other guests (many of them Japanese) immediately. The lobby is a nice place to hang around, as is the rooftop terrace (stargazing!) ! 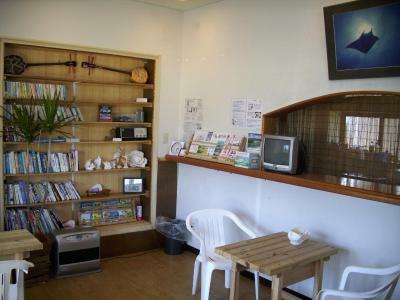 The hostel is located in Shiraho, which is a village close to the airport. The rocky beach in front of the hostel makes for good sunrises but not much else, so you will have to rent a car, scooter or take the bus to the interesting parts of the island. The bus to the ferry terminal takes about 30 minutes. But there are good local restaurants and supermarkets within walking distance of the hostel, even a karaoke bar! Thanks to the whole team for this nice stay! The bed wasn't the most comfortable, but it was okay overall. The staff were really nice! The location is great too, very close to the sea. Everybody was very helpful. 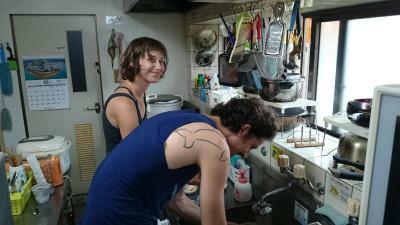 Best hostel I stayed in Okinawa. The owner is the best. He will sit with you and explain everything about Ishigaki. They have affordable tours as well. The place is lovely and in a very local/ quite area but close to the bus station that will take you to everywhere around the island. Close to the airport as well. Was a really nice experience. I really enjoyed the time there. Host were really kind and tell you every local things. Bus station is 2 mins walk. It’s always nice to meet new people. I did not find anything I disliked personally. Just as a note though, the facilities such as the shower and kitchen are not brand new (but very very clean!) and there are lizards and other insects inside the hostel. However, everything is very clean and you are in nature so of course there are insects! As soon as you walk in you feel comfortable and the staff provide a warm welcome. The explanation during check in for the surrounding area and Ishigaki was excellent, and the staff provide great tips for sightseeing and keeping things local. The location is very close to the airport with buses every 15 minutes or so, so catching you can travel to the airport without any stress of missing your flight. The best thing is that the staff wants everybody staying to get along with each other, so they try to arrange for everyone to go out during the day or night as a group - which is great if you are a solo traveler! The neighbourhood is very local, with a few local restaurants and cafes which you will not find in the central area of Ishigaki - so you feel like you get the full Ishigaki experience here! I sadly only stayed for one night (I wanted to experience the stay at this hostel as a recommendation from my sister) but when I return to Ishigaki I will definitely stay in this hostel longer! 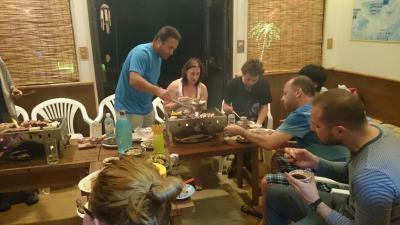 There is a real sense of community within the hostel, just like there is all over the island. If you want to feel at home as soon as you walk in the door, this is your place! Amazing staff who were more than happy to share their love about Ishigaki with me. Such a beautiful spot that’s perfect for relaxing and making friends! Ps. There’s a really cute pet pig called ‘Pigumi’ too! Some noise from the beds. The rooftop is just excellent. Just grab a local draft beer and enjoy the starry night. There is a beach just nearby within 5 minutes walk. And the best cake shop "Papiru" is just 10-mins walk away. Anyway, it's easier to travel around the island with a car. And the hostel cat Shima is just too cute..!